Use the Select Shape tool to select one or more items. Right click to open the Edit Menu. Select Transform followed by the required operation. The Reset Bitmap Orientation command resets selected bitmaps back to their original orientation. Note: You need at least one item selected to use the Transform Submenu. Select Arrange followed by the required direction. Note: You need at least one item selected to use the Arrange submenu. Use the Select Shape tool to select two or more items. Select Align followed by the type of alignment. Note: You need at least two items selected to use the Align submenu. Use the Select Shape tool to select three or more items. Select Distribute followed by the type of distribution. Note: You need at least three items selected to use the Distribute submenu. The Make Same Size submenu is used to make the selected items the same size as the item just clicked on. Use the Select Shape tool to select the items you want to change. Right click on the reference item. Select Make Same Size followed by one of the options: Horizontal, or Vertical, or Both. Note: You need at least one item selected to use the Make Same Size submenu. The Tool Submenu provides an alternative way of selecting an editing tool. 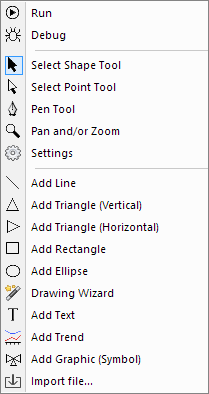 Note: For information on how to use each tool refer to the Graphic Editor Toolbar. For the different ways you can select shapes to edit. For a complete list of keyboard shortcuts.